Having travelled from a far-off place, Saharah periodically visits your town to peddle her extraordinary fabrics. 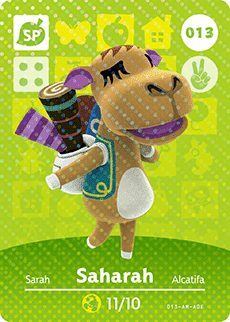 Part with a mere 3000 Bells, and Saharah will redecorate your home’s main room with exotic wallpaper and flooring that you can’t find anywhere else. The quality stuff you get from Saharah is well worth the price! Her birthday falls on November 10th, meaning that her star sign is Scorpio.